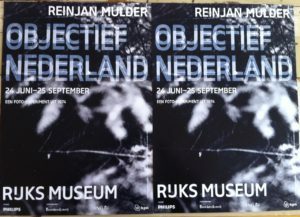 In the summer of 2016 the Rijksmuseum Amsterdam showed ‘Objective Netherlands’, 208 vintage-prints artist Reinjan Mulder (1949) made in 1974, showing a completely new view of the Netherlands: ‘as objective as possible’. In this article he remembers how he developed his ideas in the seventies, and how he completed his experiment with the help of the Dutch Ministry of Culture, the Dutch Art Council, and many farmers, busdrivers, fishermen and civilians. IN 1972 I WROTE AN ARTICLE for the Dutch student weekly Propria Cures making a plea – still relevant – for portrait orientated films. In the visual arts, we had paintings with landscape orientation and portrait orientation, photographers often took square photos as well as images with landscape orientation and portrait orientation, but when filming moving reproductions of reality we still always had to make do with landscape orientation. Perhaps it would be difficult for cinemas to install a screen with portait orientation, but since the advent of television, we had been able to make programmes that would necessitate the camera being turned on its side. In those days, I was very much involved with the question of whether we were actually seeing the world as it was. My graduation thesis dealt with often unseen criminality on land and property belonging to the Dutch Railways – apparently rapes took place in toilets on trains, for example – and I wrote a lot about art for PC, where I was the editor. I visited museums frequently but what I quite often missed in modern museums was austerity, consistency. These were the early 1970s, a time of conceptual artists for whom the idea transcended the artwork, in which land art was emerging, with artists who took marvellous long walks over the hills. But that for me was too bitty. It was too intuitive for me. There was usually no fully formed idea behind it. It was certainly nice, and sometimes even beautiful, but what was beauty? What I saw never seemed to me to be thought through and I was quick to think that I could do better. I pondered on a way to produce a much more fulfilling picture of reality. This had a lot to do with my background. I had never been to art school; I studied philosophy and law at university, with criminology as a minor. I was thoroughly familiar with formulating theories and conducting quantitative research. I also drew a lot. 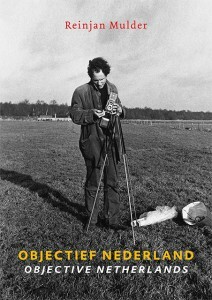 In october 2018 a second book on Objective Netherlands will be published by nai010 Publishers. 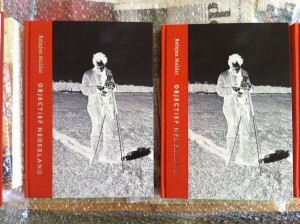 In this book also the photographs Celo Wächter made in 2017 on the old spots. But in my drawing there was still little that was experimental. I liked Breitner’s cityscapes and Albert Marquet’s fine French landscapes, and I had been filling sketchbooks with my landscape drawings since I was 16, following in my father’s footsteps: a respected amateur painter in the Betuwe region of the Netherlands. I had learned the more technical side of drawing from him too: viewpoint, composition, adding accents – just as I learned how to develop films and print photos from him later. Looking back, I can see now how much I followed him, even to the extent of the equipment I chose. I bought the same black Rowney sketchbooks he had, in the fantastic shop for artists materials A.J. van der Linde, on Rozengracht in Amsterdam. Years before I had one, my father had a Rolleiflex, the well known camera used by the well known Dutch photographers Johan van der Keuken and Ed van der Elsken. And he swore by Kodak’s coarse-grained, fast TriX films that I would later use for my project, developed in slightly warm Rodinal to enhance the grain even more. I had already used his processes to enlarge and print numerous photos in his dusty attic in Geldermalsen before I, at the age of 21, spent the small sum my grandmother had left me on my own secondhand Rolleiflex from Satina in the P.C. Hooftstraat in Amsterdam – right across the road from an uncle who did something professionally with photography. If you draw and take photos so passionately, and you’re interested in science and philosophy, sooner or later you’ll come up against the issue of selection and the frame. Where are you going to stand when you draw or take a photo? And why? Which angle do you choose? And does it make a difference? In other words, how does the frame you choose change the reality? 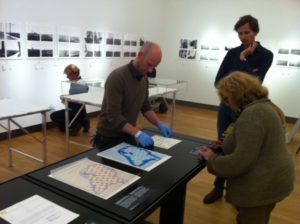 In photography, cropping during printing also comes into play. Are you going to give your image landscape or portait orientation, how far should you zoom in and how high do you want the horizon? What I noticed in the museums I visited, for example, was that many landscapes depict a road that often runs at an angle to the front of the picture. That indicates that the artist was standing on the verge – or pretending to. That’s not so surprising, since it meant that he wouldn’t be knocked down by a car – or a horse and cart – while painting and he could get home again quickly if there was a sudden thunderstorm. But a foreigner visiting an exhibition of Dutch landscape painters could easily think that our country consists for the most part of roads that run forwards at an angle. And that is not the case. Many painters make that sort of decision intuitively or they obediently follow what they have been taught at art school. But anyone who is interested in the theory of observation starts experimenting. People were doing that a hundred years ago too, when painters such as Breitner used photography to try out new ways of cropping and new viewpoints. But what I started to ask myself after a few years of experimenting was: what would happen if the framing of an image was left out completely? And if that is not possible: if I were to leave it entirely, and I mean entirely, to chance? Only then would we be able to see exactly what a frame does with the image. I wanted to eliminate the subject of observation and find out what that changed in the image we have of reality. That has something paradoxical about it, something insoluble too: what do we see, what is there to see, if we cannot choose from all the possible images? Will we then see everything there is? Die Welt? Was der Fall ist? Or will we perhaps see nothing? That paradox is exactly what makes it so fascinating. I wanted to see whether I could show a world that existed independently of a subject, independently of myself, independently of us. A world that is still there even if no one is looking, and no one is – actively – reproducing it. That also has something romantic about it too. I wanted to show things, nature ‘as it was’, without me. I wanted to see without looking. Break loose from the self. And by doing so, from all our selves: from us as people. I must have developed this radical approach – I cannot call it anything else – during my time as a student. When I went to the University of Amsterdam in 1966 as a first-year philosophy student at the age of 17, I was thoroughly initiated to begin with in the issue of learning, of knowledge. What I remember of that first, rather confusing year – after which I never took a second year due to circustances I won’t go into here – was that I ended up in an interesting, enthusiastic Wittgestein group. The group had been formed under the auspices of the student association Cogito and met every month as an extracurricular activity in a huge summer house behind Prinsengracht where we discussed Ludwig Wittgenstein’s Tractatus logico-philosophicus. That was quite a change from my old school in Tiel. I had landed in a completely different world. We sat for hours, night after night, discussing facts, images and reality, and when we got tired someone would start playing the double bass that stood in the house. Der Fall: how on earth were you to translate that? And: what were the Tatsachen in the second chapter, from which we formed ‘images’? Almost everyone in our group went on to do something else afterwards. One became a maths teacher at an Amsterdam high school, after all the usual drifting, another became an architect, a third wrote the history of the Netherlands’ second Golden Age, and I – I became a visual artist, then a scientific researcher and then a journalist. But I never forgot that very first sentence of the Tractatus. And it would become the basis for my big photo project: ‘Die Welt is alles, was der Fall ist.’ When walking for hours through the meadows in the east of the Netherlands, it kept on hammering in my head: alles, alles, was der Fall ist. In the meantime I took classes at the former premises of an old diamond factory, the Diamantslijperij, in logical positivism and the Vienna Circle from a certain H. Mulder, who taught German at the Gerrit van Veen School. I took classes in logic from funny Ms Barth and was taught the methodology of social sciences by the mathematician and later literary theorist J.J.A. Mooij. He was the one who introduced me to the strict rules of the psychologist and chess player A.D. de Groot which would serve as my guide in my project. It was also De Groot who hammered away at the requirements of reproducibility and verifiability, which I tried to meet when recording the Netherlands. The essence of the conviction that has stayed with me since my student days in the 1960s is that we do not know what we see, but see what we know. And what has occupied me since then was how I could eliminate that subjectivity of seeing, of observing in order to obtain an image of reality: ‘Was jedes Bild, welcher Form immer, mit der Wirklichkeit gemein haben muss, …ist die logische Form, das ist, die Form der Wirklichkeit.’ How could we escape from traditional, historical and social selection processes when seeing and reproducing the world? Because not only did we see what we already knew, what we knew had been taught to us in our society and our culture. We were ‘one-dimensional’ beings, to use Marcuse’s terms; we were ‘preprogrammed’ by society. Our view was coloured from our earliest youth by our upbringing, environment and traditions. ‘A man hears what he wants to hear and disregards the rest,’ Paul Simon sang on the radio in 1970, and I wanted to add a variant by showing what we didn’t see, because we didn’t want to see it. I wanted to shed light on ‘the rest’. Such notions were my reason for looking for ways of ‘objectifying’ our view of the world. And that brought me to the ‘randomisation’ of our view, of our focus. I wanted to objectify the world by eliminating the personal preferences and experiences of the person who saw it and replacing them with chance, arbitrariness. In 2017 Reinjan Mulder worked with Cleo Wächter to recover the original 1974 project. Here shown in Nieuw Vennep. Photography would be a far better technique for this than drawing. Drawings are affected by the draughtsman’s emotions, the one-sidedness of his outlook, his knowledge, his culture, his inherent or acquired motor skills. With photos – and even the early photo pioneers recognised this – you can eliminate all that to a great extent. I thought it would be interesting for me or someone else to take a large number of photos at random places and then take a look at what you passively and unresistingly get to see. That ‘getting to see’ was essential and quite different to ‘seeing’. It was at that time – I was studying law by then – that I read an appeal in the paper from the Municipality of Amsterdam, calling on proposals for an experimental photo project. That was my opportunity! The appeal encouraged me to develop my relatively vague ideas and put them down on paper. It persuaded me to make the leap across the line that divided what I knew, the humanities and philosophy, from artistic practice. I submitted a proposal and after a couple of months a friendly man from the municipal advisory committee for photography visited me in my little room in my student flat. My proposal, he said, stood out from all the others. However, he also saw immediately that I was not a professional photographer. I didn’t even have space for a bed in my room – I slept on a mattrass on the floor – never mind space for developing dishes, print washers or an enlarger. It was very doubtful whether I would be granted the assignment. The budget had been made available under pressure from photography associations in Amsterdam and a cowboy operator was the last thing they wanted. The assignment was accompanied by a sum of 10,000 guilders – many times my annual allowance – and if I had been able to get my hands on that, it would have instantly made me a professional photographer. But I hadn’t reckoned with the closed shop of the art world in Amsterdam. Amateurs had to stay that way. That was the message later conveyed by Oscar van Alphen, one of the committee members, to me, his ‘esteemed colleague’, in a nice little letter. Documents and maps of ‘Objectief Nederland’. Rijksmuseum, Amsterdam. To my considerable relief, a similar grant application to the Ministry of CRM shortly afterwards was taken seriously – and eventally accepted on the advice of the recently appointed experiments committee in the Dutch Arts Council. In the early 1970s, the Minister of CRM under H.W. van Doorn had established a state grant for experiments to go some way towards countering the reproach that the arts budget only benefitted established artists. And I was able to make use of it. I was anything but established, as the Municipality of Amsterdam had made very clear. They wanted me to fill in some forms about my prior education and my experience as a visual artist, but when I refused, arguing that art should be about art and not about the artists, that was accepted without comment. The only requirement the Ministry imposed was that the photos I took should be of good quality. That led me to abandon my plan to use the recently developed, fully automatic Polaroid Land Camera to take the photos and, after I had demonstrated by means of a trial project that I was able to produce good results working with the Rolleiflex and printing photos, the last hurdle was overcome. I might not have trained as a photographer but I now had state recognition as an artist and could set to work. My wish to show everything that was there ‘objectively’ naturally encountered a number of practical drawbacks. But if you want to get ahead, you have to persevere. This was an experiment. I had to start somewhere. And weren’t drawbacks only there to be solved? My ultimate aim was to show everything, but for now I would restrict myself to the Netherlands. And to seeing at eye level, the eye level of someone of average height, 1.72 metres. Me, in other words. I also decided not to attempt seeing in all directions and at all angles, but to choose the four points on the compass: north, east, south and west, and to take a purely horizontal view. The view to the east and the view to the northeast might differ, but would be negligible across the board as regards the composition and the objects that appeared in front of the lens. And if the point on the compass did make a difference, then that would become obvious in my project itself. Once I had enough shots in an easterly and southerly direction, I would know immediately whether there was a difference between them and, if so, what that was. And this was the way I tackled any further problems, solving them as objectively as possible. Where was I to plant my tripod, if that was to be done at random? Which sites should I go to? I could throw a dice or darts to decide, but I would achieve a better result by spacing them out evenly and placing a grid over the Netherlands. This would prevent me from only taking photos in the west or north of the Netherlands, or all of them in meadows. 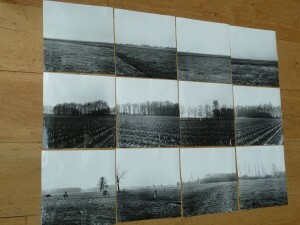 I decided to use a grid that would produce about 50 sites spread throughout the Netherlands. I placed a grid on top of a map of the Netherlands supplied by the Dutch ordnance survey in Delft to identify about 50 points at actual distances of about 63 kilometres. By doing that, I was eliminating even more subjectivity. By taking a grid measuring 63,639.61 metres and placing it at an angle of 60 degrees in relation to the north-south axis, I obtained ‘representativity’ of location, as it is called in the methodology, and my result changed from a random sample to a ‘verified random sample’: verified as regards degree of longtitude and degree of latitude. I was able to simplify the project even more. Because I had chosen to use 52 ‘topographic maps’ from the Ministry of Defence to find the sites to visit, and when these maps were made no one had looked at the content, demarcations or the locations on them, I decided to focus entirely on these 52 maps when selecting the sites. 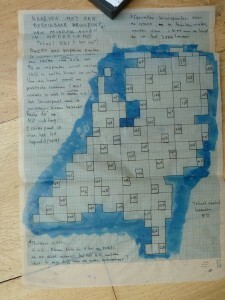 Although I had initially thought that I would lay my grid over all the maps together and then calculate the degrees of longitude and latitude accurately to the metre, I decided – because it would make no difference in terms of the result – to take the centre points of each of the 52 maps I had bought. That made it easier to approach the site, i.e. travel to it. I was always able to see a site on the map that I could get to by bus or train. But above all, I realised during a small test run, this had the advantage of giving me an additional verification method. Not only could I locate the sites the system had pointed to more easily, using the map and a compass, but I could also check that I had reached the right spot when I got there by means of reference points on the map such as woodland, dikes, church towers and buildings. By looking at the map I was able to calculate beforehand what would be visible on the photos I was going to take. When I got to the spot I only had to look and see if that was right. That meant that I could be sure that I had reached the right spot and other people could also see at a glance that I had not made a mistake or cheated. I would be fully complying with the ‘verifiable’ and ‘reproducible’ requirement that I remembered from my lectures on methodology. A last hurdle I still needed to overcome was the time factor. At many of the places I went to, it made a difference when I took the photos. The weather could change; the light in the morning would be different from the light in the evening. But other, visible things happened over time. Cars or cyclists would go by, birds would fly across the image, people would come home from work, lights would go on, cows would be taken to the milking machine. Because of the limited time and the limited initial budget, I solved this factor pragmatically too, in the hope that I would be able to do something more about it later, in a subsequent project. I would have liked to send assistents out to all my sites, or at least some of them, once a month or once a week, at different times of the year to take the four photos at the same time, but a subsequent project never got off the ground. 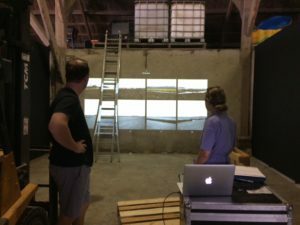 That would have produced an installation that would show us an extract of a whole year in the Netherlands in the space of an hour or so. Oh, what a lovely dream… But what I had to do first in 1974 was select a number of routes that would cover as many chosen sites as possible and could be traversed within one day. I would set out on these routes at about 9am and just see how far I got and whether I managed to reach all the locations I wanted to cover that day. Once I arrived close to the place I needed to be, I would switch to automatic pilot. I checked the images on the matt glass of my Rolleiflex using the reference points, set up my tripod and then I immediately took the four photos I had calculated at home. I did so calmly and carefully and made sure they were straight but I did not wait for different or better views. I would quite simply do what I had to do. Waiting until the light improved, or until something interesting came along (a pretty woman, a flock of geese) was absolutely forbidden. When that posed a problem because – on a busy road for instance – other configurations came into view every second, I would (I instructed myself) first count to ten after setting up my tripod and only then ‘quite simply’ shoot. I could not allow myself to be influenced by what did or did not appear in front of the viewfinder and I stuck to my plan. Reinjan Mulder: Objectief beeld van Nederland, 1974. 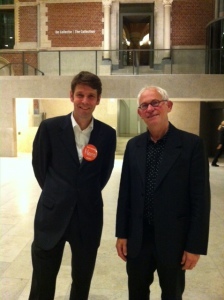 Collectie Rijksmuseum. To enable the result to be verified in that respect too, I recorded the time when I took each photo as much as possible. Then everyone – or otherwise a higher power – could see how I had stuck to my method. I recorded the routes I travelled in a book and I faithfully noted all the times the photos were taken in my little notebook. I applied the same routine to the rare cases where one metre to the left or to the right would make a difference. That was the case, for example, in the living room of a house in Velp where my system had led me. Before I went, I had worked out exactly how many paces I would take and what the the angle from the door, the hall and the window had to be. And that’s exactly what I did, counting aloud, just as I had done earlier in my project, counting so many paces as I walked along a ditch and then so many paces straight into a meadow. Once I had established all these rules I was able to go and try out my objective way of seeing. But before it got that far, other obstacles emerged. The Municipality of Amsterdam struck once more. I had graduated in 1973, I had got my visual art assignment, and less than a month later the mayor, Ivo Samkalden, threatened to put me out on the street in the middle of winter by enforcing an injunction he had personally signed. If I didn’t move my belongings elsewhere quickly, the city cleansing department would remove them. There was a seven-year waiting list for a house where I could finish my project; I wasn’t eligible for artists’ housing; and I had doubts as to whether I would feel like starting again in 1980. On top of that, the news came that fuel would be rationed due to the oil crisis, so I also had to abandon my plans to hire a car for the project. Luckily I was able to clear these hurdles too. I found somewhere else to live at the very last moment; I bought a train and bus ticket and so my project, Objective View of the Netherlands was still able to start in January 1974. I soon began to enjoy myself. 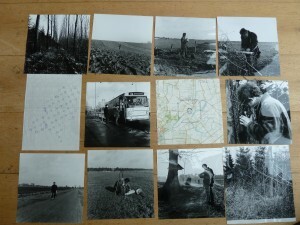 After a few weeks travelling by train and bus through the Netherlands I could see my project increasingly taking shape. I also started to get a better idea of what the end result would be. Until that January, I could only speculate about the outcome. But now I could see what it would become. Although it certainly hadn’t been my intention, the photos – and so the sites I visited – turned out to be so much prettier and more interesting than I had expected. I quickly had to rethink my idea of the Netherlands. I was amazed at how much countryside there still was in the Netherlands. I also discovered, for example, that there were far fewer roads and houses than I had thought. On the other hand, despite hardly seeing any people in all those weeks, traces of human life were to be seen almost everywhere: a church on the horizon, a freshly ploughed field, the stalks of maize that had been cut months ago, a hut in a meadow. What we call ‘natural beauty’ was hard to find. Encouraged by my success, I decided to expand my project a little at the end of the journey. This might be questionable methodologically speaking, but I had done most of the work by then and if it didn’t produce anything I could always leave these results out. My plan had originally been to seek out as many sites as possible on land, because I was afraid that sites out at sea or in the IJsselmeer would be impracticable for me. How could I ever get just off the coast of Zeeland? But after I had managed to reach so many sites on land without any major problems, I took the train to Enkhuizen on the off-chance of finding a boat that could take me to the spot on my maps where axes intersected on the IJsselmeer. And I found one. I discovered the buoyage vessel ‘IJsselmeer’ in a side harbour in Enkhuizen, whose captain was happy to interrupt his buoy cleaning to take me to the spot for my photo. The sites for my photos have seldom been as accurately recorded as they were that day on the IJsselmeer. With the sextant in his hand, the captain used a lighthouse and a little church behind the dike to set our position; I unfurled my map on the map table and then, using the enormous ship’s compass, we determined where due north had to be on the horizon. I was given similar assistance later on from the harbour service in Vlissingen who took me out onto the North Sea, and another time from two friendly men in a motorised flatboat belonging to the Dutch Ministry of Infrastructure and the Environment in Lauwersoog. They needed to go to Terschelling to carry out inspection work and take some water level measurements as they sailed along and on the way they were able to take me to the spot I indicated. In the end there was nowhere on the water that couldn’t be reached by chatting to people and doing a bit of negotiating. 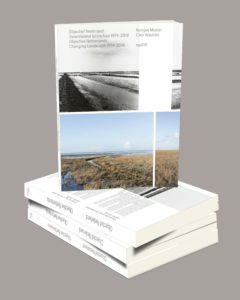 My project grew from being an objective view of the Netherlands to an objective view of the Netherlands including its territorial waters. And so I discovered that my original assumption that there was hardly any nature left in the Netherlands had to be adjusted. When you looked closely, there was plenty of nature to perceive: on the water. At Enkhuizen and off the coast of Zierikzee you could sometimes see as far as the horizon without a trace of human intervention to be seen. But that seeing would never have been possible without a very special form of human intervention. My project was helped enormously by a particular letter from the Minister of CRM, which the Head of Arts at the Ministry had given to me at my request. In it, the Minister asked everyone I came across to help me with my work in every way possible. In a law-abiding country like the Netherlands, that was sufficient: every door opened for me. A side-effect of the letter was that after a while I started to use it more and more as an excuse, as a license for my perhaps rather strange project, in the minds of other people and eventually also in my own mind. If anyone let it be known along the way that they attached little credence to the necessity of taking a photo of ‘almost nothing’ in the middle of nowhere, I kept a straight face and took refuge behind the letter that I removed from my inside pocket. I could then join my discussion partners in their amazement at what strange thing our lords and masters in The Hague had come up with now for us to do. When anyone asked me why on earth I had to take a photo in that exact spot, in between the sprouts in their back garden, I simply pointed to the cross on my map and then, slightly desperately, to the letter from the Minister, as if to say ‘I’m only carrying out orders’. And so, as the project went on, I increasingly became the pianist, the blind executor of some business that was as impenetrable to me as to them: exactly what I had wanted to be in this objective photography project. 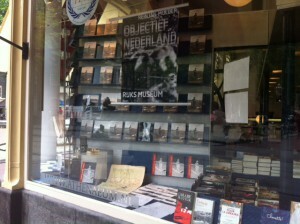 More information on Objective Netherlands is available on our new website.